Nana V is a nick name given to my mother by my daughter Sarah, because it was easier for her to pronounce than Virginia. My mother’s favorite time of the year was autumn. She often referred to autumn as “the third season.” She celebrated the beginning of the “third season” with the harvesting of a crop of chili pepper plants growing outside one of our kitchen windows. My mother loved chili peppers and included them in many of her favorite recipes. Unfortunately, chili peppers were seldom stocked by grocers in our neighborhood, so she decided she would plant her own. Her favorites were jalapenos and serranos; two varieties that she knew were easy to grow successfully. In early spring, the “first season,” she set up a small planter on the inside sill of a sunny kitchen window to germinate seeds for her tiny pepper garden. When the sprouts were strong enough, she would move two or three of the strongest plants to a platform on the outside of the window. The plants were always small and produced only about two or three dozen peppers per plant, but that was enough for her. Throughout summer, the “second season,” she would nurse these plants into producing flowers and eventually fruit. 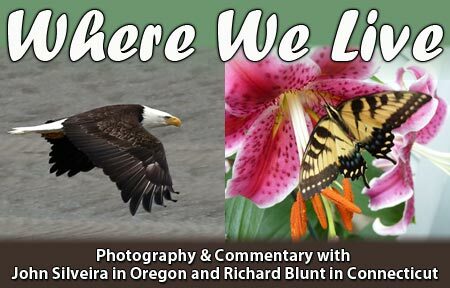 The growing season for chili peppers in this part of the world in is a long one, and her small crop of peppers were seldom ready for harvest until the end of September, and often as late as mid October. The calender date didn’t matter, as far as she was concerned it was summer until her peppers were ready to harvest. She felt that autumn, (“the third” season”), should only be celebrated after her chili pepper harvest. Last year, two garden killer storms, one in September and the other in October, destroyed most of the crops in the Farmington valley, including all of my chile peppers. 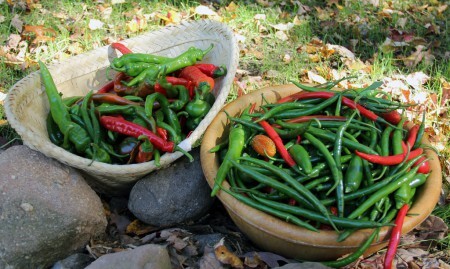 This season the weather was perfect for growing everything, including chili peppers. By September my pepper plants were loaded with fruit. I calculated that their 80 day growing cycle would be complete and ready for harvest at the official start of autumn on September 22. However that day passed and my peppers were not quite ready for harvest. All signs were pointing to mid October chili pepper harvest . 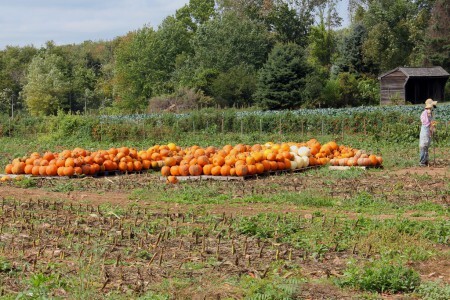 This year, my mother’s unofficial “third season” harvest celebration would be late. 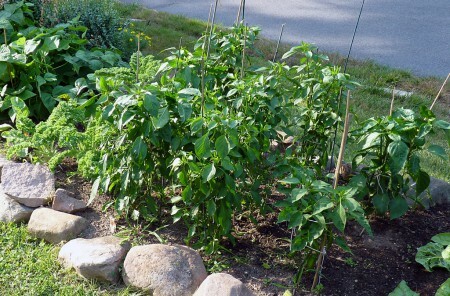 A heavy frost was predicted for most of Connecticut on Friday night October 12, and fortunately my peppers would be ready for harvest by then, so I planned to harvest them the day before. From the 8 bushes that I planted: two jalapeno, two hot cherry two hot Portugal and, two cayenne, I picked about 40 pounds of peppers. What you see in the picture below is what was left after sharing my harvest with friends and neighbors. This year, I am happy to share my celebration of Nana V’s, late but successful, “third season” harvest with some photos of Autumn in the Farmington Valley. The eight pepper plants below were given to me by the folks at Krell Farms. This picture was taken in early July and by mid September all were full of healthy fruit. These plants produced the finest crop of peppers that I have ever grown in my garden. 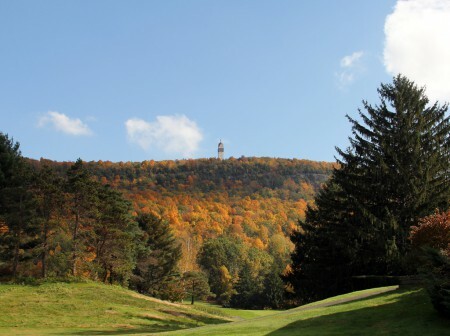 An autumn view of Heublein tower on top of Talcott Mountain in Simsbury Connecticut. 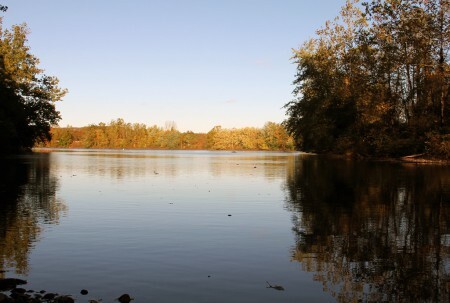 The Farmington River as it flows behind Kolp Gardens. Meet the Krell family. 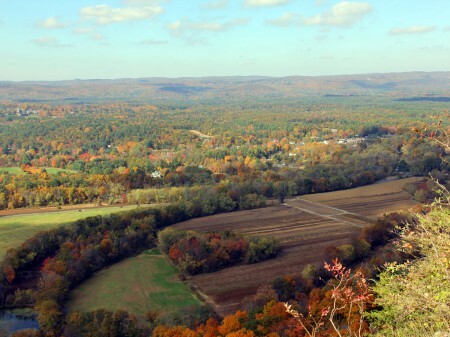 These folks own and operate one of the most productive farms in the Farmington Valley. In the spring they prepare the Kolp Garden plots for planting. When the growing season ends in mid October they plow the fields again, and plant a cover crop of winter rye to nourish the soil and keep it in place over the winter. 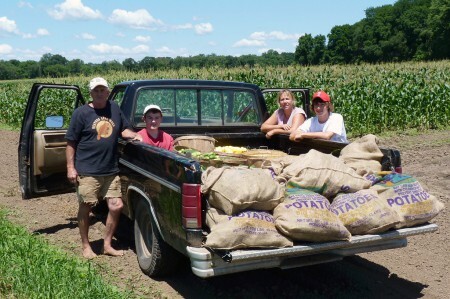 All of the corn growing in the background belongs to this family. 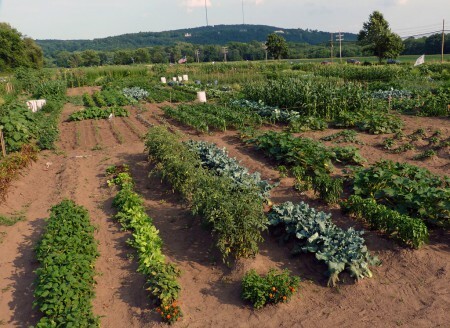 In other fields they also plant potatoes, tomatoes, cabbage, pumpkins, summer and winter squash. All of the Kolp gardeners that I have spoken to praise how fertile and productive the soil is in these field. They also understand and they all understand that this family of professionals deserve credit for this success. Gardens like those pictured below require consistent and timely care by the gardeners. The meticulous and professional maintenance of the soil provided by the Krell family is of equal importance. 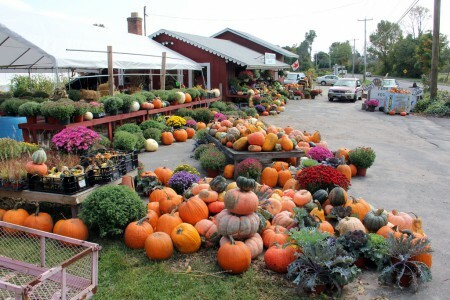 The Krell family farm stand is a popular week end stop for many folks that live in and around the Farmington Valley. Some of the best tasting heirloom tomatoes that I have ever tasted are sold here this late in the season. Apple picking is also a “third season” tradition for the Blunt family. 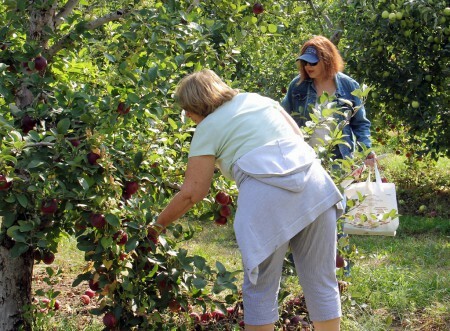 Here my wife, Tricia,(on the left) and a close family friend ,Ilene, are picking apples at a popular Valley orchard. Ilene drove to Connecticut from New Jersey to join us in this celebration. 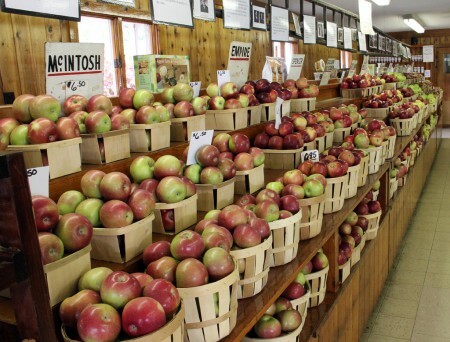 This orchard also has plenty of apples for customers that prefer to have their apples picked by someone else.